We are having another challenge at One Stop Craft Challenge today with the theme of Stitching faux or real! Prize: Set of the latest stamp plates worth £40 - check out the OSCC blog to see the lovely stamps you will be getting if you win this challenge. I just got this stamp from Bugaboo and I so love it! I had asked Jodie for more Deacon stamps and boy did she deliver. She added quite a few for Valentine's Day that I loved so much I bought them all. Check out the new Deacon stamps here. MFT die-namics - say what? So head over to One Stop Craft Challenge and enter your card for a chance to win the wonderful prize. 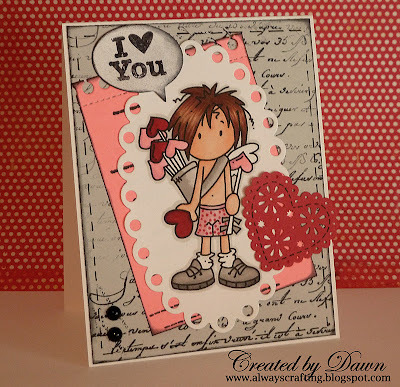 Totally adorable card Dawn!!! You have colored that image gorgeously. LOVE that Martha punch! Super cute image...he looks so innocent. Hope you will stop by and see my stick pin pictorial. This is so cute! Thanks for joining us at Glitter Geeks this week! Really cute! I like the choice of papers! Your coloring is great too! Great card Dawn, I love the script backing paper. Dawn....I just got this darling image and your card makes me even more excited to start working on him....may have to do a little casing here. Thanks for the inspiration. OMG, I loveeeee that image. He's soooo cute!!! Your card is beautiful. Great colouring. Thanks for joining us at Di's Digi. This is just gorgeous,love your take on the colour challenge your design is beautiful. Thank you for taking part in the Bugaboo challenge. Wow love your card, you cant go wrong with Stella! Thanks for joining CTB for our color challenge, I hope you will join us again soon! Oh my goodness, Deacon looks fantastic. Thanks so much for joining in with us this week for the Catch The Bug "Red Velvet" Colour Challenge with Bugaboo Stamps. I hope you enjoyed it enough to join us again this week for our Anything Goes challenge. Adorable card! Thank you for sharing with us at Meljens Designs, however, we do require a Meljen's Designs image on our entries - please visit us again soon, we love your work!